Finding a Pearl District restaurant can be overwhelming, but with our comprehensive reviews you’ll find something in no sweat. These select restaurants (below) are for a special occasion or just a casual night out. Because the Pearl District is so diverse, everything from fancy white table clothes, to brown paper bag burgers is available. We hope you enjoy. While closed on Sundays, the Bluehour is great for a special occasion. Bluehour has won numerous prestigious dining awards in over ten years of continuous operation, having been hailed as “Portland’s most exciting restaurant” by Gourmet Magazine. Bluehour is a special night out choice by all means, expect to dress nicely. The owner, Bruce Carey, is known for other award winning restaurants and his attention to detail. Bluehour serves some of the city’s most fine wines and steaks. Learn more about Bluehour. 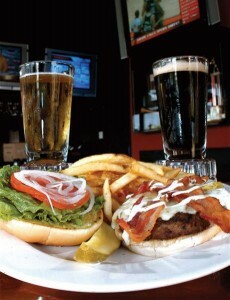 On Deck Sports Bar & Grill is your simple night out. Relax and enjoy some burgers + beers. And all ages are welcome of course (until 9:00 PM), as this is a family originated eatery. The outlet hosts some amazing TVs, including a 68 inch setup. The burgers are stacked with fresh and tasty ingredients, from local sources. They are definitely “big juicy” burgers. The service is usually good, too. Learn more about On Deck. The outside seating is available weather permitting, otherwise indoor seating is an option. In the summer this is a great Happy Hour gathering spot. These two picks are both the complete opposite dinning experience. We think both are good picks in both food and quality service. Enjoy!